Please welcome the incredibly talented Cynthia Weber to the blog today! I met her on the Hometalk forums where it didn’t take me long to fall in love with her beautiful home and easy conversational style of writing. 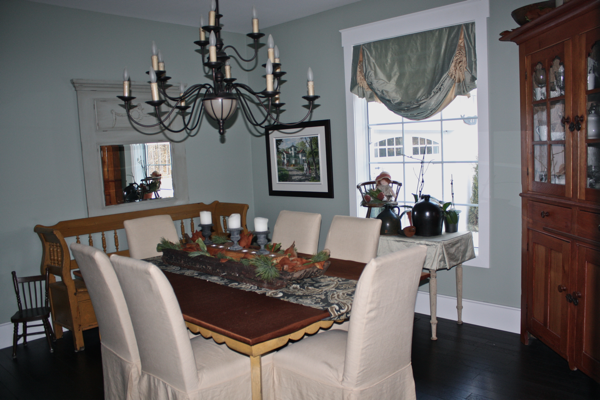 Cynthia is an interior designer as well as a blogger at A Button Tufted Life. 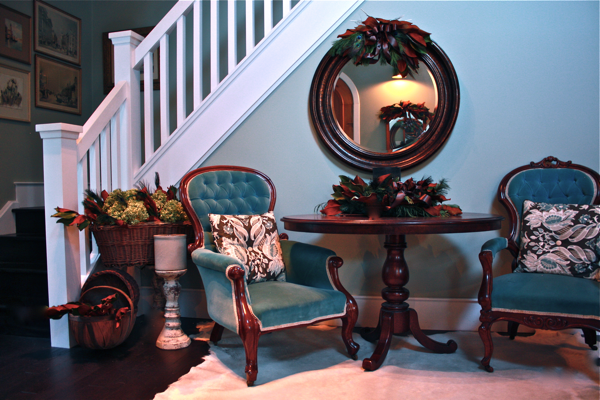 She was recently featured in a New York Times article about safely decorating during the holidays. Take it away, Cynthia! 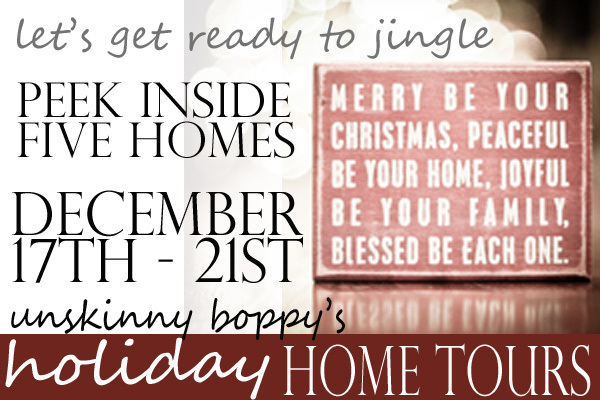 I am so excited that Beth asked me to be part of her Holiday homes tour! 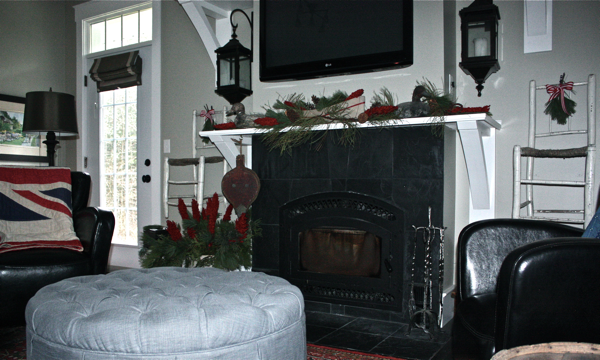 We love to entertain in the home we built a few years ago. 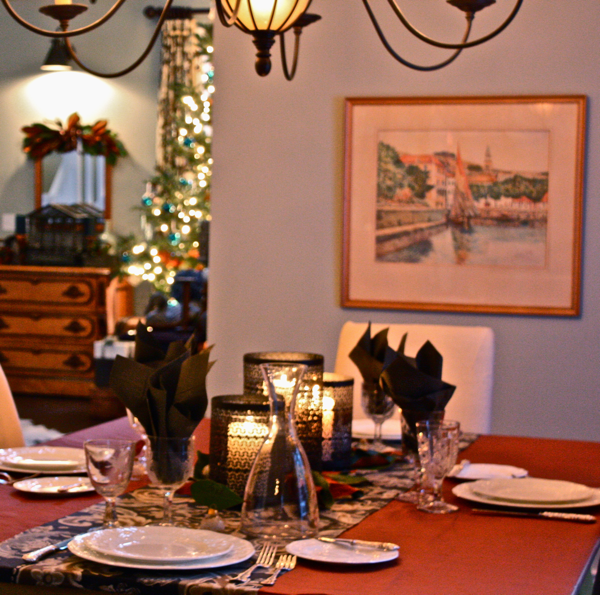 Clients often become friends spending long evenings enjoying good food and conversation. We call our home Hoop Top House because we designed it around a salvaged 8′ Hoop top door. I had a pair of columns that we bought at an auction, we cut them down a bit and they became urns for the front door display. Pine, cedar and hemlock boughs around a bunch of white stick make up the base for the arrangements. 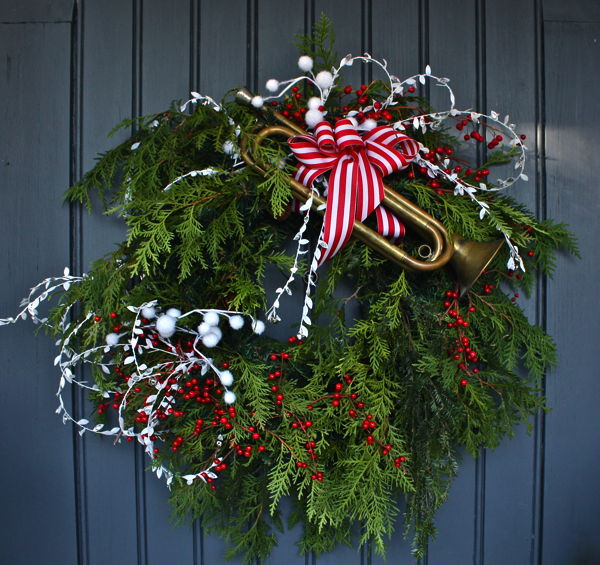 A Pop of red from some berries and a whimsical spray of airy leaves then candy cane striped ribbon and a trumpet to herald in the holidays. It’s all about the tree Isn’t it? This is the first room you see when you come in the front door. 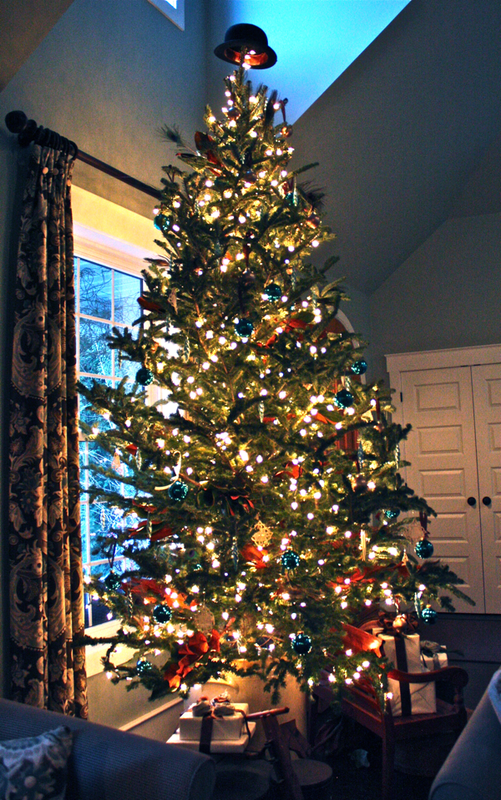 I love having a live tree for the holidays. In a room with high ceilings like this one you can have a big one. 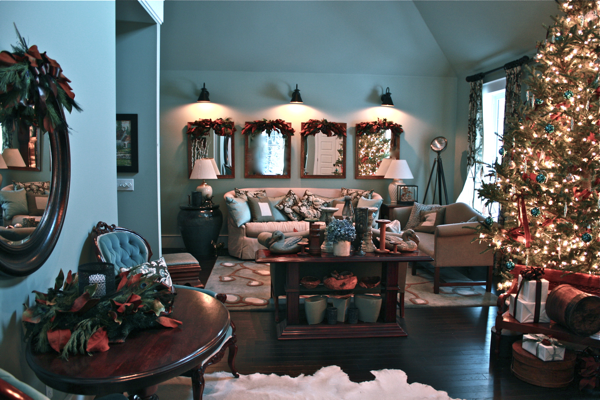 Magnolia played a major part in my decorating for this room. I am not going to lie… they gave me a hard time. For some reason they thought it would be funny to just fall for no reason one after the other just as I was feeling good about things! I loved how the tree reflected in the mirror. Child sized furniture is kind of an obsession with me. 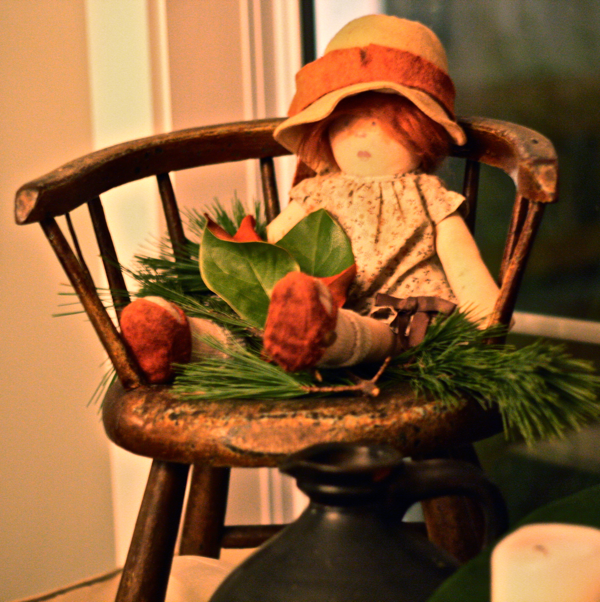 I have a collection of little chairs and toys that I use throughout the house. You will see a few more as we go along… I even hang them on the walls. In the evenings the sconces cast beautiful shadows. They ring the room and lead you up the staircase to my studio. Topping our tree with a bowler hat is a family tradition. Eclectic style appeals to me. For the tree I put a mix of vintage, handmade and new ornaments. I’m not joking, I also made roses from it for my gifts. You can see a few on the photo above. This is the tablecloth I was referring to. 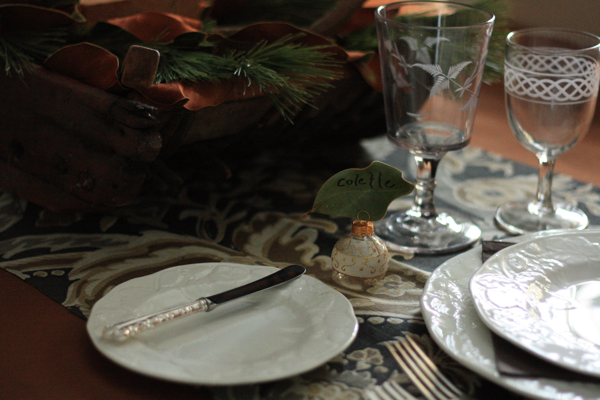 It is a silk fabric remnant that I wrapped the table with. After the party it was a bit stained but I didn’t want to throw it out so I ripped it into strips and made roses for my gifts and bows for the tree. My husband called me smarty pants that day! Another Little chair… I did warn you! Now we are off to the family room. 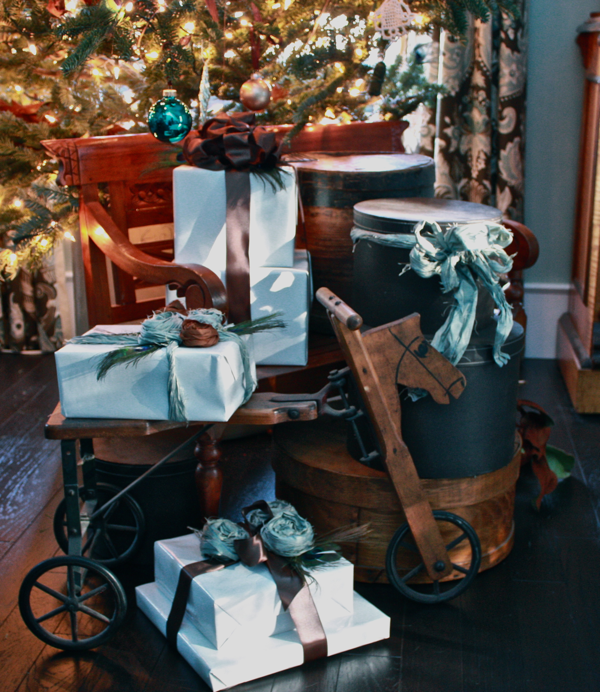 I like to have a more rustic traditional Christmas feeling in this space. 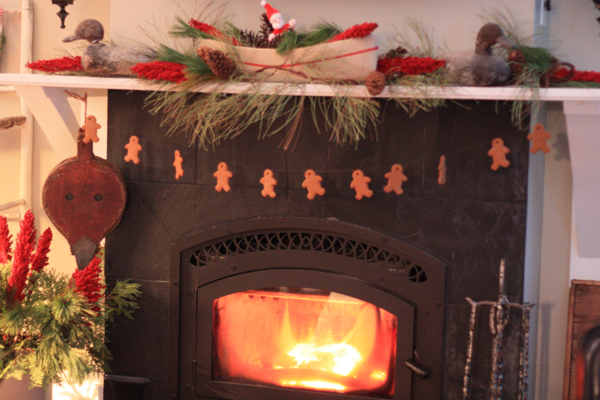 We spend a lot of time here relaxing in front of the fire. 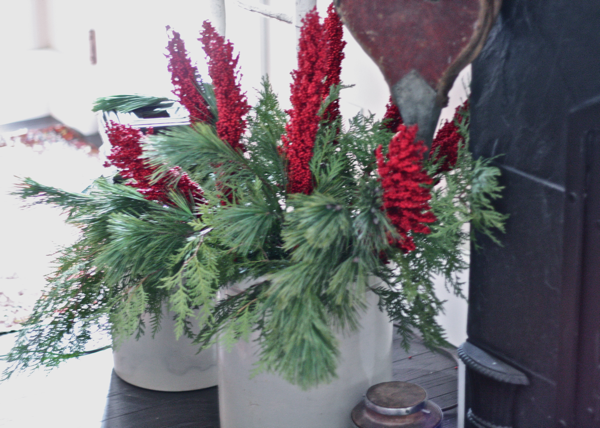 This year I added pine and that candy cane ribbon to dress them for the holidays. This is Emmitt on his favorite perch. He surveys his kingdom and stays warm all at the same time. 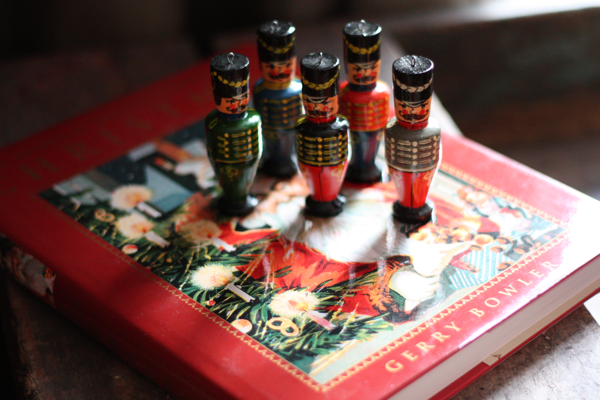 A gathering of toy nutcrackers dressed for the holidays sits on a book of Holiday traditions from around the world. 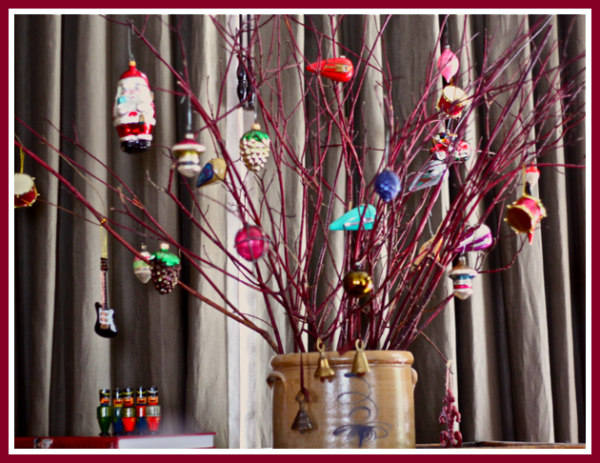 Rather than another tree I opted for hanging ornaments on dogwwod branches. I like how rustic and simple it feels. The ornaments have been collected during our married life, a few of them are from Kents’ childhood. I just love looking at them. 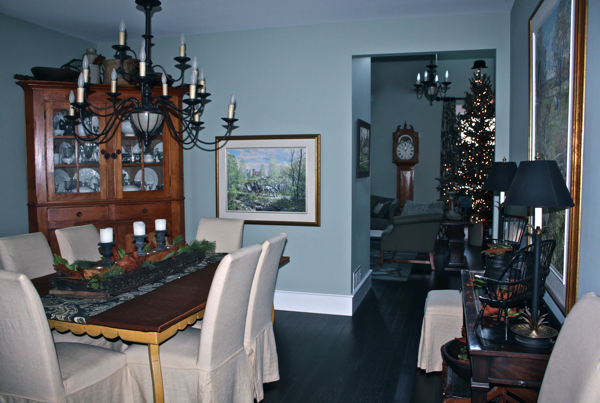 The kitchen is open to the family room, I love that especially during the holidays. 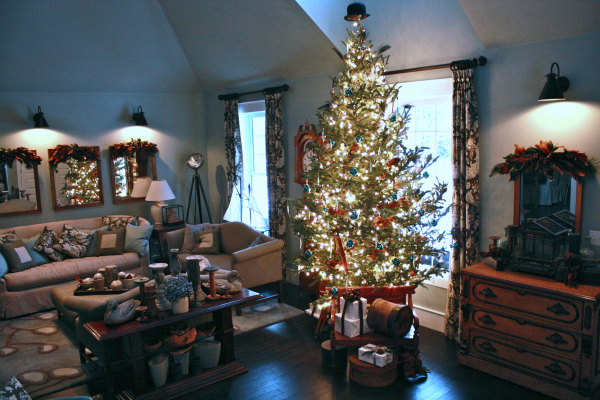 I didn’t do to much decorating in here, just a few sprigs of pine here and there. Here is the island ready for a recent holiday party. 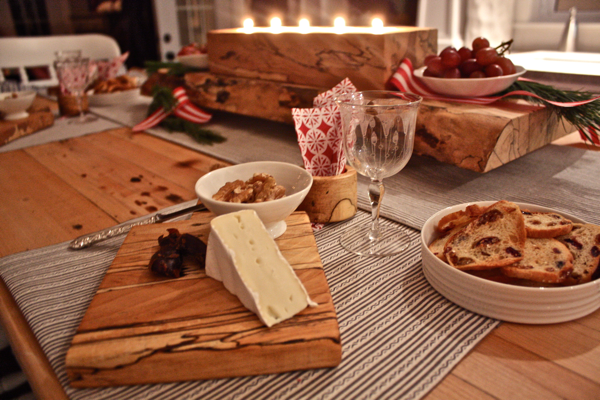 Kent made the spalted maple breadboards as well as the rustic candleholder and stand. Well, I think that is it for the tour. I hope you enjoyed it! A huge thank you to Beth for letting me share my home with her fantastic readers! 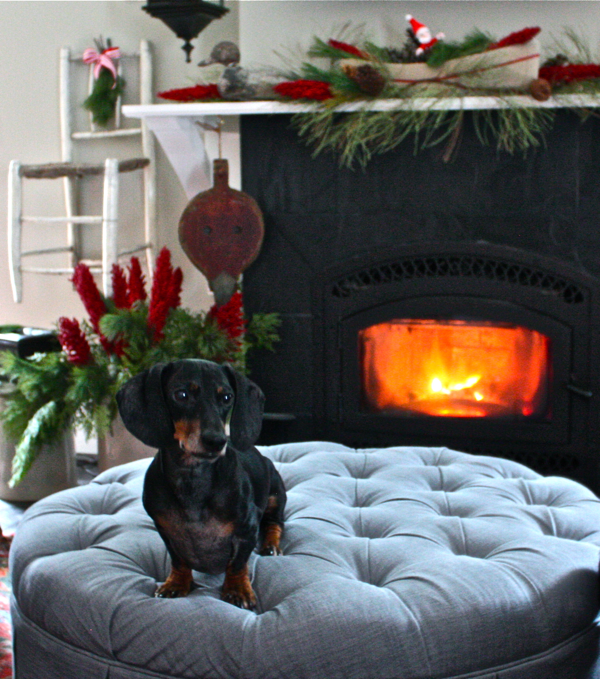 If you are interested in coming over to check out A Button Tufted Life… You are always welcome! Have you ever seen a bowler hat on a Christmas tree before? That is such a cute tradition! Thanks so much to Cynthia for sharing her amazing home with use today! If you see any photos you’d like to pin, please consider clicking over to Cynthia’s blog and link to the original source. 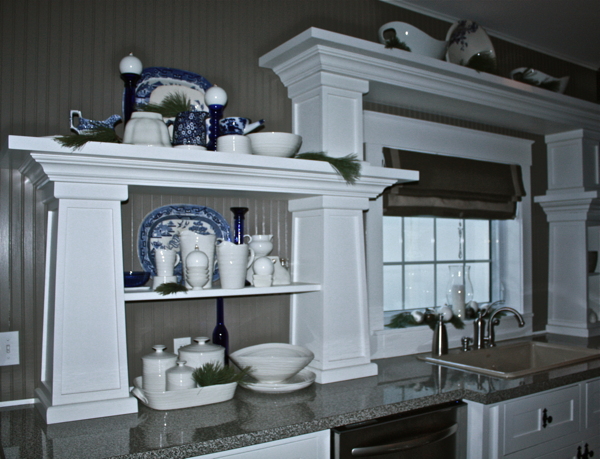 If you loved touring Cynthia’s beautiful home please leave her a comment here! 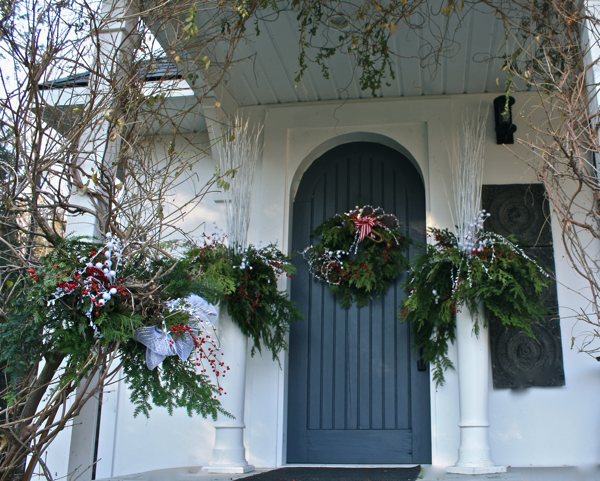 In case you want to visit all the previous homes on the Holiday Home Tour this week, please click over to check them out! I promise you will NOT be disappointed. WOW! That kitchen! And I love the hat as a tree topper 🙂 Everything about Cynthia’s home is warm and inviting … thanks for sharing it! 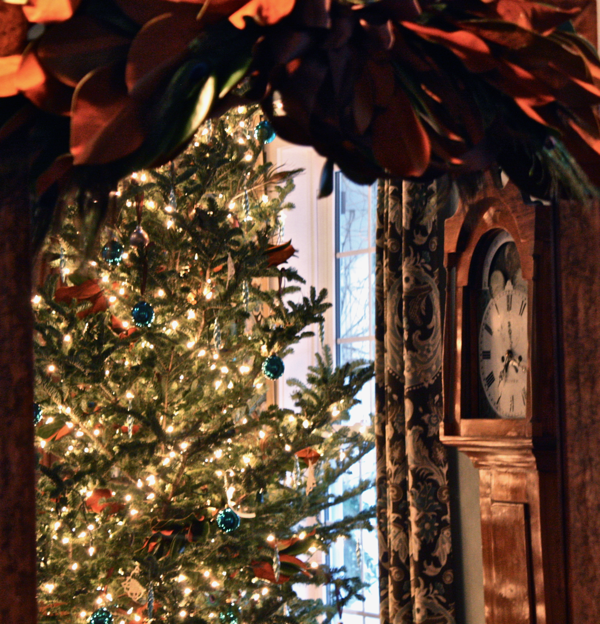 Beth and Cynthia, thanks so much for sharing this beautiful home decorated for the holidays. First, let me say that I have always admired those hoop-top doors, so from the moment I saw the entrance, I knew this was going to be a fabulous house. 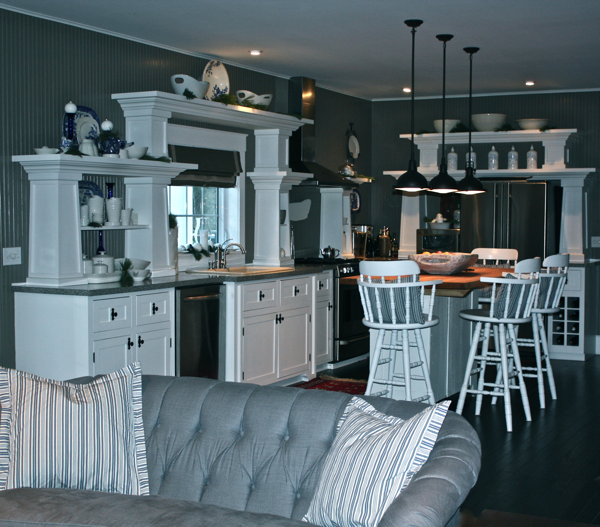 I saw so many unique features of the home such as the cabinetry in the kitchen and those chairs mounted on the wall beside the fireplace! I will definitely hop on over to Cynthia’s blog to see more! 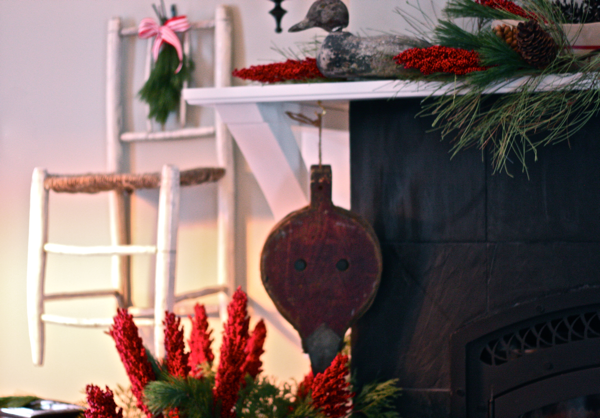 oh I DREAM of that fireplace – so cozy! …and what a cute pup! WOW! Seriously what an amazing house, I’m speechless! Oh my goodness, so much loveliness I can barely stand it! 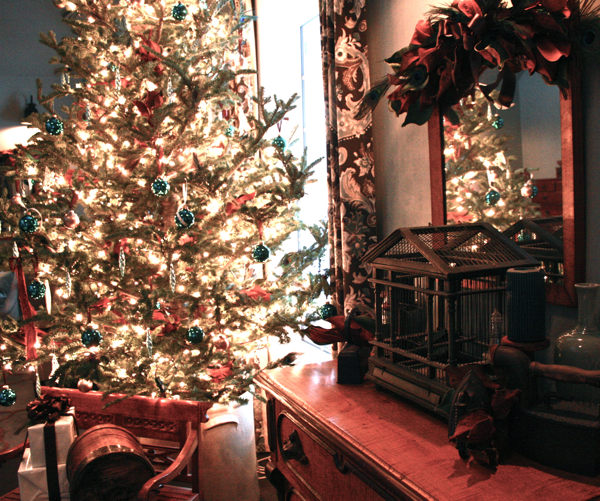 Thank you for letting me be part of your fantastic holiday home tour! And to everyone who has left comments here and on my blog…BIG HUGS! You are all so kind. What a beautiful home! Thanks for letting us in! 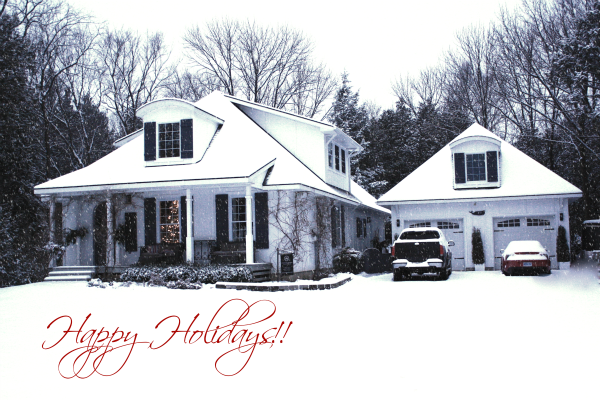 I love the picture of their home surrounded by snow! Cynthia, those columns out front are so fabulous! What a great idea!!! I see columns like that from time to time and now I want to try that!! You home is beautiful, thank you so much for sharing! All so pretty, love those gingerbread men!